If you are looking for an honest and trustworthy Encinitas auto repair facility that also serves Carlsbad, Solana Beach, Rancho Santa Fe, and Del Mar, consider Complete Car Care Encinitas. Established in 1992, we have been providing our friends and neighbors in the North County San Diego with dependable and top-quality auto repair and maintenance services. We are a family business located at 318A North El Camino Real, Encinitas, CA 92024, and we’ve been at this location since our doors first opened. 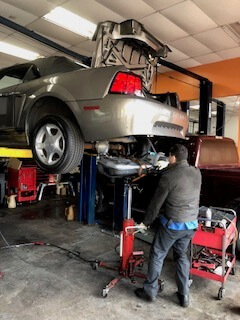 We have a team of experienced and ASE-certified automotive repair technicians who perform auto repair and scheduled maintenance services on all import and domestic vehicles, specializing in drivability, check engine lights, and factory services. Whether you are in need of vehicle diagnostics, engine repair, air conditioning and heater servicing, or an oil change, the ASE-certified automotive experts at our Encinitas auto repair shop will make sure you are safely back on the road as quickly as possible. While our automotive technicians are working on your vehicle, we invite you to spend the time in our beautiful and comfortable lobby. There, you can enjoy our various amenities, including coffee, tea, hot chocolate, cookies, bottled water, TV, great magazines, and interesting books. We provide customers with complimentary shuttle service and loaner cars when their vehicles are due for major repairs that will take more than a day to be completed. We can also offer pick-up and drop-off service to our customers when it’s needed. Call us today or visit our clean and professional location in Encinitas, CA to see what makes us stand out from other shops in the area! Gift Cards are now available at our shop! Give the gift of peace of mind with Complete Car Care's gift cards. You can purchase them now at our shop in denominations of $50, $100, $150, and $200. Complete Car Care Encinitas (CCC) Warrants the parts and labor provided by CCC, on selected repairs (ask manager for details) for a period of 36 months or 36,000 miles after the date of repairs, unless otherwise noted on the front of this service order. Brakes and air conditioning are guaranteed for 12 months or 12,000 miles, whichever comes first. During this period CCC will or repair or replace, at our option, any defective part supplied and installed by CCC. Having Trouble on the road?